Image courtesy of Michael Johnson / The Copper Works, Newlyn. Copper has long been valued and worked by humankind. Ancient civilisations, dating back nearly 10,000 years, have utilised the versatility and natural beauty of this remarkable metal. In Britain, copper-mining areas such as Cumbria and Cornwall have encouraged traditional copper-working beyond just the industrial and utilitarian. Keswick School of Industrial Art, for example, founded in 1884 by Canon Hardwicke Rawnsley, a champion of the Arts and Crafts movement, at this time, started as an evening class of repoussé metalwork in the Crosthwaite Parish Rooms, just outside Keswick, Cumbria, and the Cumbrian Copper tradition, producing beautiful pieces of decorative metalwork was born. In Cornwall, the areas around Hayle and Newlyn, especially, are also synonymous with copperworking. Newlyn and the surrounding area is well-known for its place within the Arts & Crafts Movement of the late 19th and early 20th centuries. Traditionally the role of architects feature highly in the evolution of the movement, yet the Newlyn School bucked the trend, as it was established by artists, not architects. The Newlyn Copper Works was opened in 1890, as part of Newlyn Art Industries, with key art and design figures such as Director; John Mackenzie and Master Coppersmith; John Pearson. The practice of beating the copper on lead not pitch was developed by John Pearson and was regarded by many as the trade secret of the Newlyn School. Initially Pearson led most of the design of structure and decoration, yet increasingly Mackenzie played a larger and larger role. 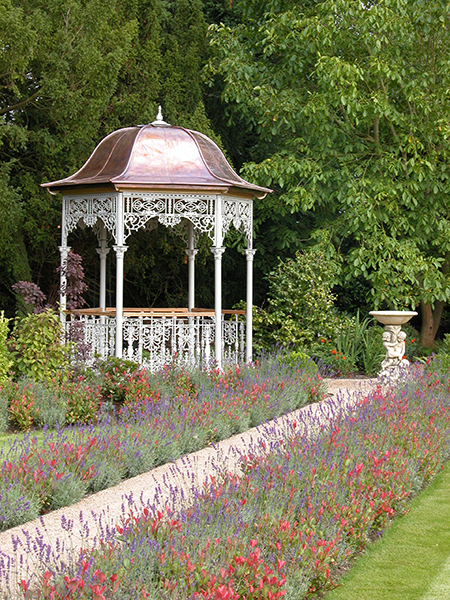 One of the key characteristics of Newlyn copper was the quality of construction and finish, with well-fitted lids, and the decorativeness of well finished, often riveted, hinges and seams. Construction displayed as a decorative feature was a key principle of the Arts and Crafts Movement and Newlyn Copper was and still is an excellent example of this, even if the Newlyn copperworkers didn’t necessarily see themselves as part of a movement at the time. Newlyn Copper pieces are famous and highly valued for their unique fluid nautical and maritime designs, which seem to both evoke and reflect the eternal movement of the sea; which is not surprising as most of the pieces were handcrafted by fishermen themselves who worked as coppersmiths during periods of unemployment or inactivity in the fishing industry. 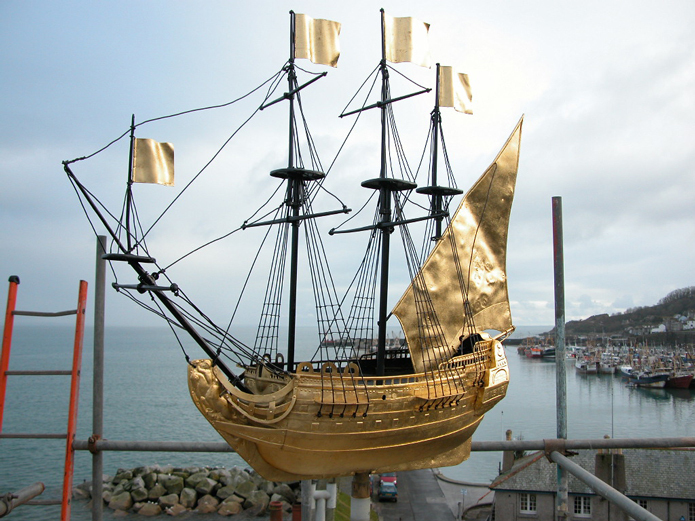 This high quality Newlyn copperworking tradition has, thankfully, been continued into the present day, albeit with different artistic design themes, by contemporary copperworker and (re)founder of The Copper Works at Newlyn; Michael Johnson. Michael spent a transient childhood in North Africa and the Middle and Far East, settling in Australia in the 1970s. 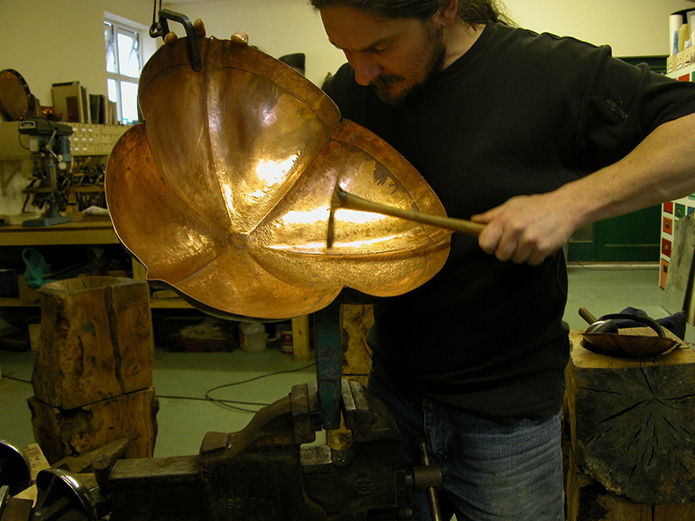 Whilst continuing his education to degree level and forging a career in dance, Michael furthered his childhood passion of working with copper leading to exhibiting and commissioning work in the 1980s, resulting in copper-working full-time, bringing the fluidity and beauty of his dancing into the physical art of copper. Returning to Britain to further develop his metalworking skills with world renowned armourer, Terry English (his uncle), hand-forming armour from sheet metal parallels coppersmith and silversmith skills, so it was the ideal ‘apprenticeship’ and Michael had the opportunity to work on such films as First Knight, Joan of Arc, King Arthur and several Pirates of the Caribbean films. 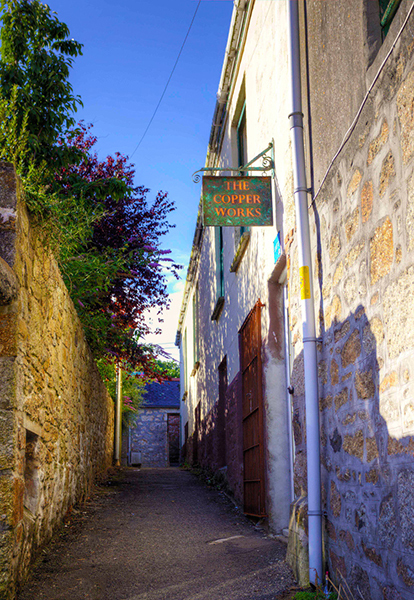 Michael established The Copper Works, Newlyn in 2004 having spent the previous two decades collaborating with and learning from a range of craftsmen working in early crafts, ranging from glassblowers to swordsmiths, all with a wide breadth of skills and a passion to draw upon the heritage of their craft and pursue with a particular degree of excellence. Michael also received encouragement and support from the last in the line of the original Newlyn copper workers – John Edgar Laity. Firstly, what do you think it is about Newlyn that has provided such inspiration for artists and craftsmen over the years? Newlyn was a key centre for the fishing industry in Cornwall for hundreds of years, certainly at the end of the 19th Century, and life was very harsh; it still is. Newlyn had lost hundreds of fisherman over the years and working with the ocean is very threatening, and fishermen had to confront the basics of life and death on a daily basis; it’s not a benign industry. The threatening and harsh environment correlated well with the emotion and feeling that artists wanted to reflect in their work. Newlyn attracted a lot of artists, painters in particular, but various strands of the arts, such as silversmiths, enamellers, coppersmiths etc. 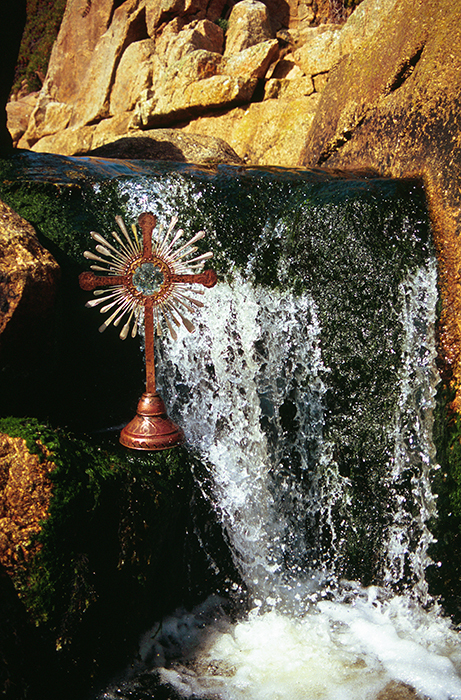 Not all the artists were incomers, some were the fishermen themselves; given all the things the men had to deal with, some turned to drink, others the church, and some turned to art. 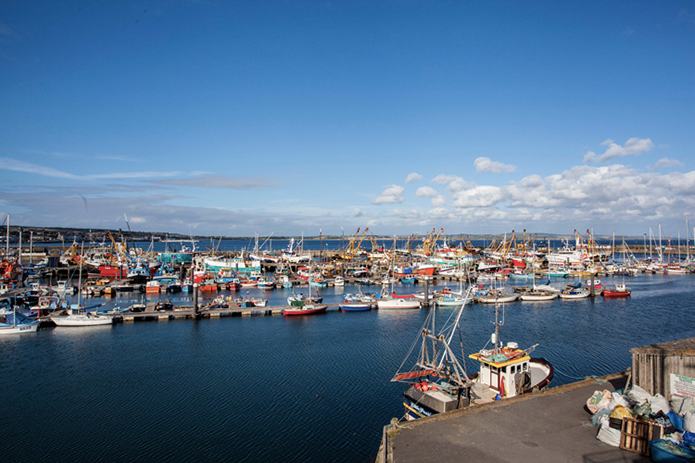 Newlyn is still a thriving, active and challenging place; one of few active fishing ports remaining. It hasn’t been ‘prettified’ and it’s still a very real, working port, unlike St Ives and Padstow. 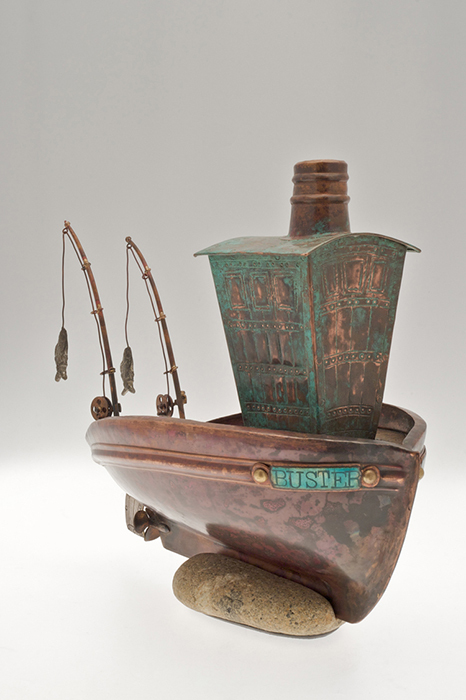 Artists today still get to rub shoulders with fishermen like they did a hundred years ago. It’s a stimulating place, a port with a real community, rather than a pastiche like St Ives, which has lost some of its integrity, which is not being disrespectful to St Ives as I love the town, but it’s just very different to Newlyn. The Arts and Craft movement became very strong in the late 19th Century in Newlyn, what with the establishment of the Newlyn School of Painting and Newlyn Art Industries. How much did the movement influence the Newlyn copper workers at that time? It’s important to recognise that when it comes to metalcraft, it was purely incidental that the prominence of Newlyn copperwork coincided with the Arts & Craft movement in Newlyn, as there was no overt objective on the part of the copper workers to be part of the movement. Newlyn copper was led by J.D. Mackenzie, who established the copper works due to his middle class and Methodist predilection to see how he could help the local community in Newlyn, which was struggling financially. It was a well-intentioned attempt on his behalf to try and help the fishermen, as he saw they were struggling. Mackenzie didn’t see them as ‘ripe’ for the Arts & Craft movement based on the ideas of William Morris; he just knew that their overriding need was to make a living. It wasn’t like the copper industry in Keswick, for example, which was much more geared towards the aesthetic of the Arts & Craft movement. Ironically, the Newlyn copperworkers produced some of the finest copperwork of the period, and hence it became associated with Arts & Crafts, but they never set out to do it, and they weren’t part of an aesthetic movement. You made a conscious decision to refrain from copying the designs from earlier copperwork; why was that and what is your own preferred design style? I chose not to copy early Newlyn copper work largely out of respect; I just felt it would be inappropriate to copy the work of the ‘Newlyn Lads’. People have suggested to me it’s possible and that money could be made out of reviving their work, but I think it should be left as it was. It was pertained to that period and doesn’t have relevance today; for instance they made copper wall sconces which were highly polished – they were highly polished because they needed to reflect candlelight in the absence of gas lights or electricity – we just don’t have a need for it today. So out of respect and deference, I just don’t feel it’s right to copy their designs, although I’m perfectly happy to restore their work, which I do. With reference to my own work, my own personal style is always secondary to the client’s preference, of course. However, if completely left to my own remit, I like mixed materials. Sometimes all copper can be a bit much; so a mixture of all or some of brass, copper, bronze and silver is nice. 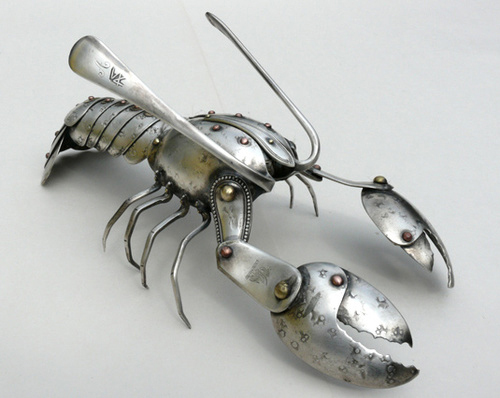 I like to re-use pre-existing materials, for instance the boxes and crosses incorporating old silver plate cutlery, and the new pieces that my apprentice Shelley Anderson is making, the lobsters, crabs and fish. 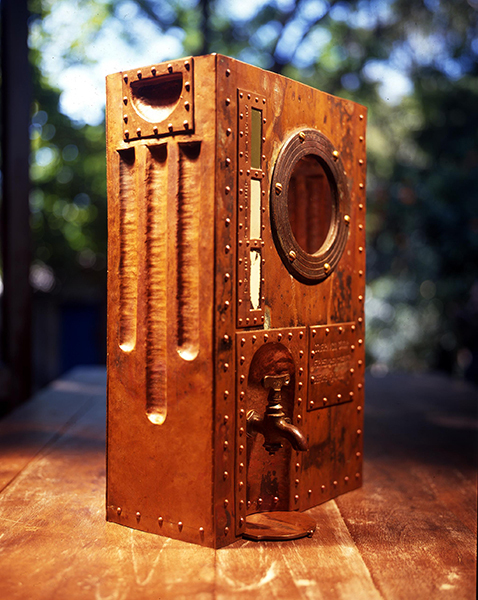 Utilitarian objects were beautiful, well crafted and designed and I like to raise their image and shine a light on the craftsmen that made them. I like re-arranging the pre-existing. My influences are quite wide-ranging; the French sculpture Rodin has been a big influence, but also many others from Byzantine and Coptic silver, indeed, many ecclesiastic subjects, to Bauhaus and the Arts and Crafts. I’m a bit of magpie in that respect. Also working with my uncle was a big influence, repairing and restoring old suits of armour; it’s only when you are repairing armour dating from the Middle Ages that you realise how elegant it is, the way it fits the human body, that it was specifically made to fit one person, like a Savile Row suit, so the person could move as fluidly as possible, like a human armadillo, it’s very graceful. It’s a bit ironic really when you realise it was defence armouring for going into battle. A popular Cornish artist, Alfred Wallis from St Ives, has also influenced me. 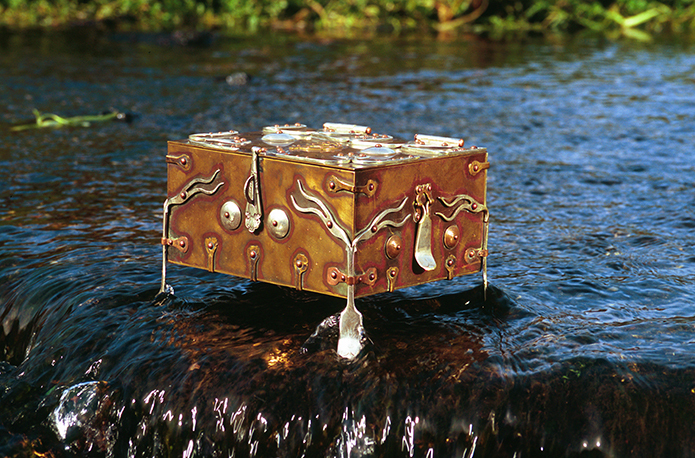 He specialised in painting boats, and I think some of my designs are influenced by his work. His paintings are slightly naïve and childlike interpretations of boats, but he’s incredibly highly respected. 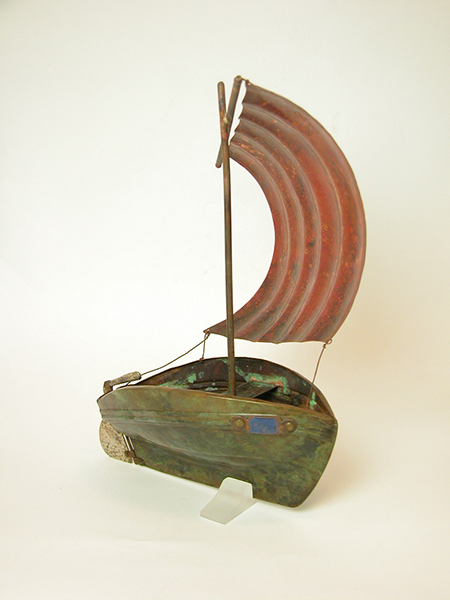 Some of my copper boats are a bit like an Alfred Wallis painting – free, loose, clumsy, and a bit daft, but at the same time, I think, and hope, utterly beautiful. You have set up your workshop in Wesley Place, which is the same building that J.D. Mackenzie used as the base for the Newlyn Art Industries in the late 19th Century. Was this more than coincidence, and do your surroundings influence your work in any way? It was largely coincidental that we came to be here. When I was looking for space I had few options at the time; Wesley Place was one of those options, and when I realised it was the old workshop, then it clinched it for me, I knew it was the right home for our workshop, but I didn’t set out with the intention of finding space used by the Newlyn Lads. They worked from several different premises in Newlyn over the years, but this was their first workshop. When we set up the workshop, there weren’t any relics from the previous copper workers, so there’s no influence in that respect. I think the general feel of being in the same building as the Newlyn Lads does influence us, but not in a daft sense. I think we’re just aware that we’re carrying on a tradition, so there’s a degree of humility in what we do, and we probably put ourselves under a bit of pressure thinking that if the Lads are watching over us, what would they think of what we’ve just created. I was recently approached by someone associated to Herbert Dyer, a famous coppersmith from the nearby village of Mousehole, who had recently inherited Herbert’s collection of copperworking tools. Herbert had walked all the way from Cumbria to Cornwall after the First World War looking for work, having got interested in copperworking whilst in the trenches; he approached the Newlyn Lads who turned him down, and so he set up a workshop in Mousehole instead, which was a big shame for Newlyn as his work was exceptional and he wrote a couple of really fine books; maybe they thought he was too good! I’d love to re-establish Herbert’s workshop within ours to create an archive of a copperworker’s workshop a century ago, so hopefully that will happen at some point. How versatile is copper to work with? Copper is incredibly versatile to work with and I don’t know of any other metal that’s more malleable. Its versatility can be increased even further when making an alloy of it, by mixing it with tin, to make bronze. I’m sure bronze was found by accident at some point in the past; both tin and copper ores are found close by in rock structures, and they would have been put in the crucible together by coincidence, to form bronze. Copper can be used for so many different purposes – for electroplating, creating oxides for antifouling, copper wire for electricity, pipes for plumbing, its antibacterial properties for medical and catering purposes are immensely important (I believe bacteria die within 2 hours of coming into contact with it – so a perfect metal for all touch surfaces like handles and taps), for whisky distilling still-making, not to mention for architectural and art and design purposes; it’s application in industrial art is hugely important, and we’re still discovering ways to use it. We can now weld copper, which we couldn’t before, due to new welding techniques and so this has opened up so many more opportunities. It’s now possible to create large copper and bronze sculptural pieces that look solid, but are in fact hollow, which has the potential of saving tens of thousands of pounds for a sculpture. For instance, a Henry Moore or Barbara Hepworth-style piece, say 6’ high, would cost between £50,000 – £100,000 to cast in a foundry, as so much bronze is required, whereas we could make a similar scale sculpture out of bronze or copper sheet by breaking it down to segments, and welding it together carefully. 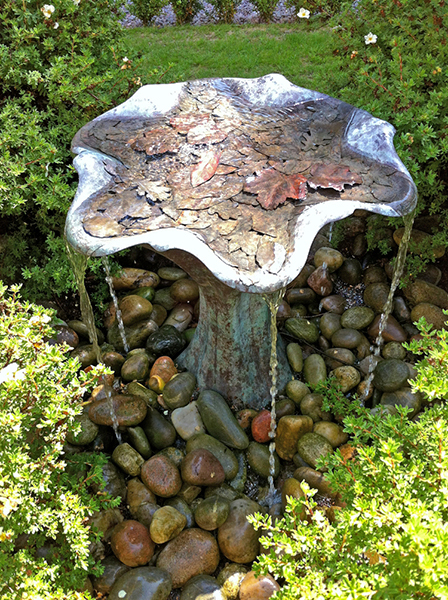 The finished sculpture can be left hollow or filled with concrete, if solidity is required. This could be achieved at an equivalent cost of about £10,000, so massive potential cost savings! 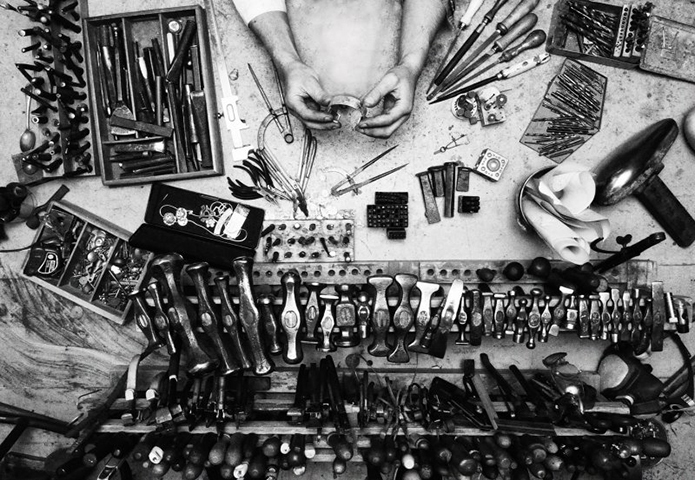 Do you consider yourself a craftsman or artist or a mixture of both? I don’t really see myself as an artist; my early art training was in the visual and performing arts, rather than formal artists training. In any case, the art world is a bit murky and subjective, so it’s difficult to say what does and doesn’t constitute art. My work demands a lot of physical skill, requiring a lot of dexterity, fighting with the metal, so in that sense it’s definitely more craft than poetry. Still, what I do comes from the soul, and is both aesthetic and I think beautiful, so in that sense it is art, but as it can only be achieved through physical skill, I would define myself more as a craftsman. I still respect the arts enormously, and what clarified things to me that I was definitely aesthetically driven via sculpture and metal, was seeing Rodin’s studies of little hands made from bronze when I was nine years old; it was so beautiful it brought a tear to my eye, and I think it was that that really started my travel in the world of art and metal. 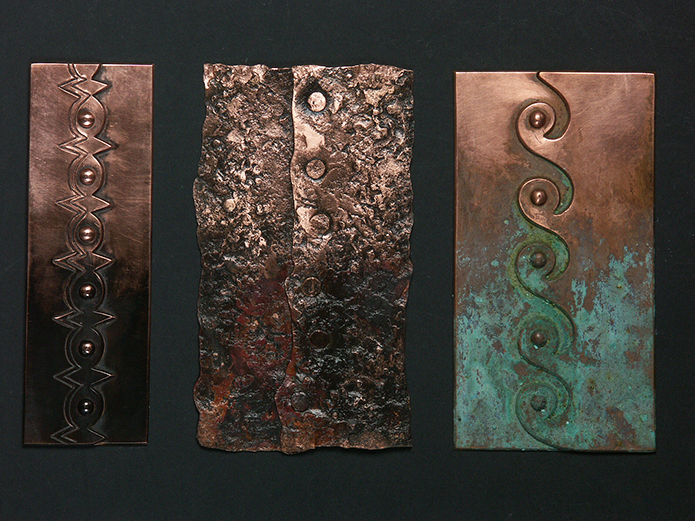 I like to think there is a lot of fluidity in my designs, showing movement in the copper, where I’ve managed to get the copper flowing and moving; I think this stems from my early dance background. 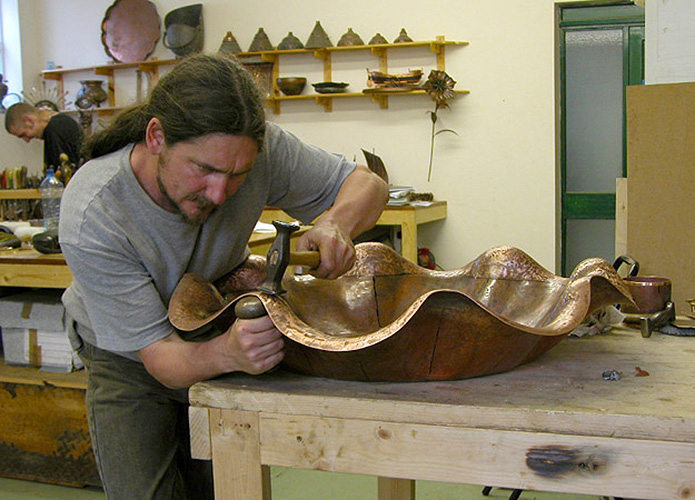 As well as copper, you also produce work in bronze. Do you have a preference for either, and do the different metals have different properties and allow you to do things that the other can’t do? Yes, for sure; copper and bronze are quite different, yet at times their colour can be similar. As an alloy, bronze is stronger and harder than copper; we can also use bronze as flat bronze, in the form of a sheet, and also cast with it, whereas copper is just sheet. If the item is purely decorative, such as bowl or vase, then I tend to use copper; if the item needs to be strong then I’ll use bronze. 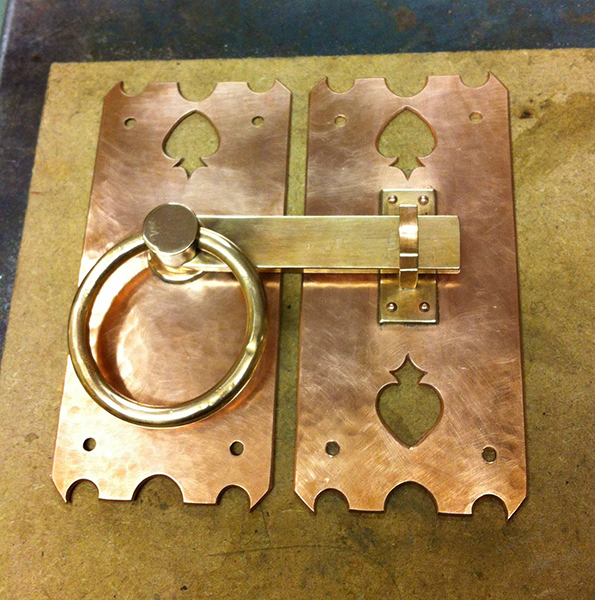 There’s so much more structural strength with bronze, and so ideal for handles or hinges. If copper hinges were used for a door, for example, then they would probably start to become loose in five-to-ten years, whereas if bronze was used then they probably won’t loosen for decades and decades, although if they’re purely for decorative purposes, then that isn’t really a problem. 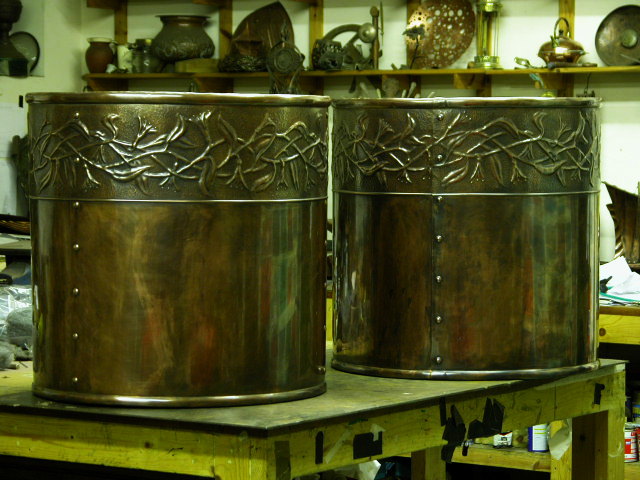 How versatile do you, as an individual, need to be to be a coppersmith? I would say very versatile. In a particular week, I could be working on a sculpture for a client, or mending a copper fuel pipe for a fishing boat, so it’s not all art and design work; we need to get involved in repairing industrial items, whether that is helping out a fisherman or mending a copper roof or downpipe. When I help the fisherman, I normally do it for free to help them out, and in return they keep me supplied with fresh fish, which seems like a good arrangement! 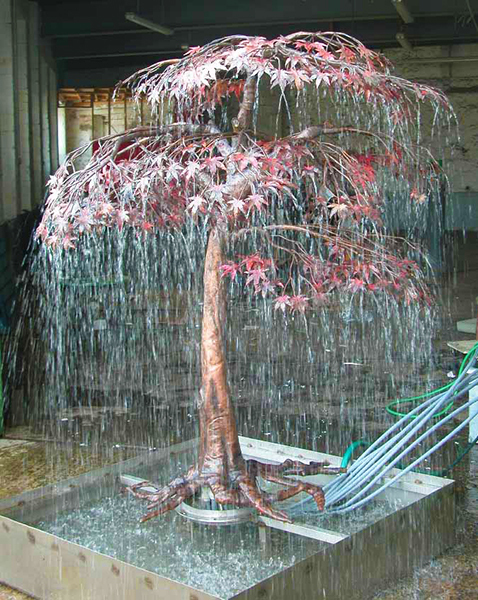 I recently completed a 6 foot high water feature in the form of a Japanese Acer tree, with nine hundred individual leaves carrying a tracery of their leaf structure, which was hollowed out to allow water to cascade over the leaves; whilst this was very much art and design, it was also essentially an engineering and plumbing project, which is why I call my work more of a craft than art, as it’s more akin to industrial art – function before form. 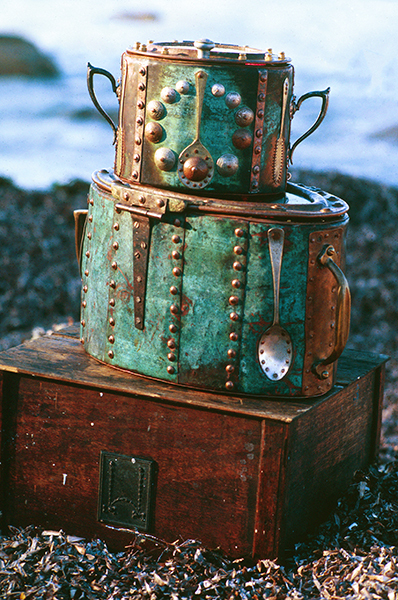 My work becomes even more diverse when I work on films; I’ve worked on 3 of the past 4 Pirates of the Caribbean films, making things like buckles and belts for all the main characters. I make the baldrics as well, which are the weapons and sword belts that are worn over the shoulder made from leather, and so I get involved in leatherwork for that, and I even do silver buckles for their shoes. Buckles for Johnny Depp one minute, drainpipes for guttering the next; that’s what a coppersmith does! Have you ever thought about experimenting and working in other metals other than copper or bronze, or possibly incorporating these other metals into your designs? I love working with other metals; I think silver and gold plate combined with copper work really well, particularly when they’re distressed to show the underlying copper. I think stainless steel and bronze work well together. There’s such a richness from working with a multitude of metals, rather than one. My least favourite metal though is brass; it’s so brittle and non-malleable, I just can’t get it fluid or moving. Brass doesn’t like being annealed, whereas you could anneal copper and bronze all day, brass just crumples after 3 or 4 attempts. How do you typically approach the design process when you start a project – do you start with sketches? It all depends on how tight the brief is. More often than not, my work is client-led, so they will already have created sketches for what they’re looking for and it’s all been fully worked out. If I’m doing it, I’ll either prepare some sketches myself, or if it’s complicated, I do have an illustrator who works with me who can provide the detail. In many cases I will make a maquette [scale model] to show the client, who can then get a feel for it, and understand the texture and feel of what the object will be like. I also make up swatches to show what, for example, the different hammer marks will look like, or patination colours. I encourage my clients to make up a swatch board of the things they like to influence the design; they pin different pictures, textures, shapes etc to a board, and sometimes even references from text, such as poetry; one of my clients was inspired by angel wings which we turned into hinges for a door. I do encourage people to think outside the box for inspiration, function, texture, colour etc. Is there a big difference in the work that you create for commissions for architects, landscape gardeners and interior designers, compared to those that you showcase in art galleries? We’re often limited to what we can do in a gallery, so in that sense there’s a vast difference. One art gallery I’ve worked with in Cornwall only gave us the ability to showcase some very small boat designs that we created, but as we have developed a relationship over the past decade, we’ve considerably increase the size and scope of the designs as they have seen what we can do, and what we’re capable of doing. We are big fans of your work, but there are people out there that don’t really appreciate the value of hand-crafted items. How do you respond to such opinions in your own mind? Probably the best analogies I can give are the differences between eating takeaway food instead of homemade dishes, or buying IKEA furniture instead of going to a master craftsman for some furniture, and holding a supermarket mug instead of handmade pottery. 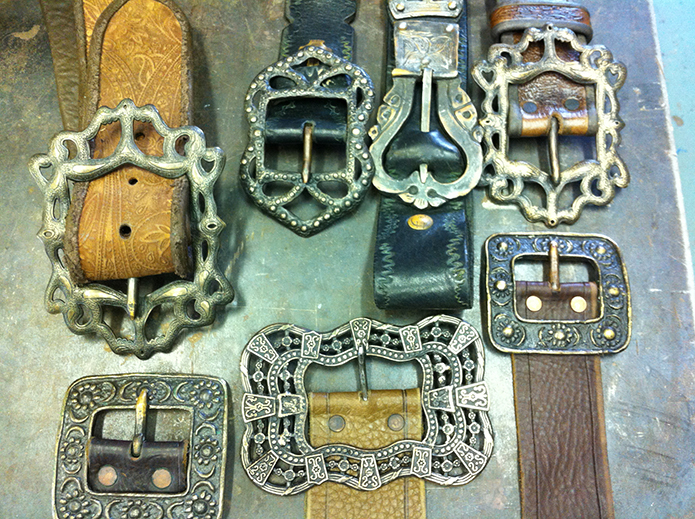 There’s something special about hand-made items, whatever they are, compared to something that is made by a machine. It’s nothing to do with intelligence or class, it’s all about having empathy for hand-crafted items, and you either feel that way about it or you don’t. I think the wheels are turning, and there is a growing appreciation and desire for hand-crafted items again. Finally, what advice would you give to anyone wishing to pursue a career in the arts and crafts, in particular dealing with the lack of financial stability initially, and getting your reputation established? Above all, I think it’s important for people wishing to pursue a career in arts and crafts, to really look at why they are doing it. Are you doing it purely as a vehicle to make money, or are you doing it because you love it and what to spend every minute of every day perfecting what you do to be the best at what you do, which is what I did. If it’s purely about the money, then this can also take the soul out of your craft; you might be tempted to cut corners to speed up the process, or start mass-producing – is that what you want? I would urge anyone to seriously think about what their objectives are; if you can combine craft with making money, then that’s great, but to spend your career in it, you need to be sure it’s because you love your craft, and not just money. I spent twenty years working with copper as an amateur before I made a commitment to making a career from being a coppersmith. I used to make items and then give them away to people as presents. I needed to know that the items I was making were of good enough quality that people actually wanted them. I found it hard to give them away though, especially when you really like a piece. Having said that, if I don’t actually love it, then it gets thrown away – if it’s not good enough for me, it’s not good enough to be sold. So, my advice would be to perfect your designs and hone your skills as an amateur before taking the plunge. 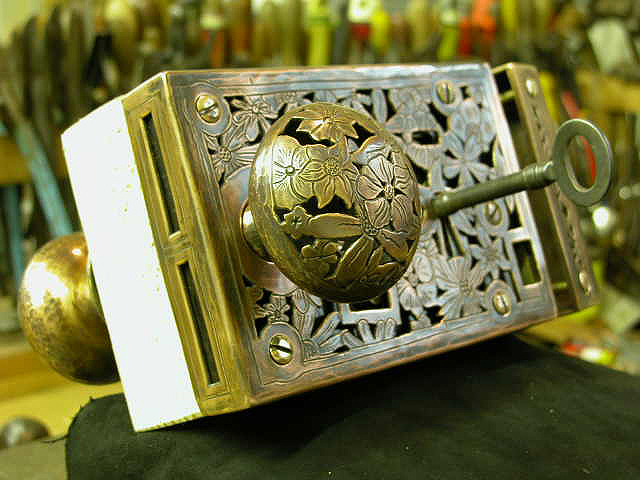 Apart from that, then you need to stick to all the abiding principles that any craftsmen or women have to stick to: the products you make have to be well made, decide on the detail of your design – is it to be aesthetic or functional or both, get the finish right (you can make a beautiful copper item, for example, but spoil it at the last moment because you didn’t concentrate on getting the patination right), make sure you are adept at marketing – selling items you make is of fundamental importance, whether that is via the internet, craft markets, car boot sales, craft guilds or workers collectives; finally, don’t give up!